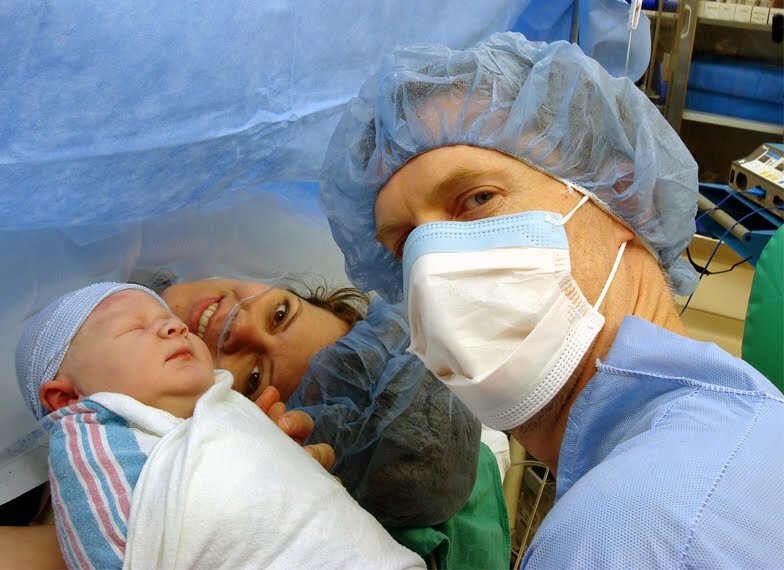 Home ParentingPregnancyCsection	Did You know it’s National C-Section Awareness Month? Did You know it’s National C-Section Awareness Month? Like approximately 1/3 of Mothers in the US today, I was introduced to my son upside down. And that one moment has caused the floodgates of emotion to well up in me many times (for many reasons) over the past 14 months. I want to talk about it though. Because while there are unfortunately many women who were not properly educated about the risks of c-section and might have been pressured to have one unnecessarily, there are the rest of us. Those who wanted natural childbirth and DID what we thought was necessary to make that happen, yet had a medically necessary C-section. Those who carry guilt and even shame in admitting to not having natural childbirth. Feeling the need to explain, yes I WAS educated and did everything “right” but I still needed a C-Section. And still feeling that people don’t believe you. And since this is National Cesarean Awareness Month, I thought now would be a good time to have that conversation. I do think a lot of my personal issue is internal pressure as I have admitted before. And many women are perfectly at peace with getting a c-section. So this post is not to condemn anyone for their feelings. But I would be remiss to say that it hasn’t been really hard for me and I don’t know, I think there are more women out there like me. There is a post over at Momotics about the negative responses to C-Sections that struck a chord with me yesterday. (She will be doing one with positive responses soon, so bookmark it to get the other side of the story!) But as I was reading, I was reminded of what a truly complex issue this is. And just like every natural/vaginal birth, every c-section is different. We can no more categorize these women than we can those who were able to birth naturally. All of this is fresh in my mind because I am currently looking for a new Dr. We are hoping to have a second child in the relatively near future and I would like to find someone supportive of VBAC locally. I have been looking online for information and unearthed a lot of old feelings. It’s been a really interesting mental process for me. Whereas when I was pregnant/planning for birth with Oscar, I really didn’t have many fears. I felt prepared and capable of letting my body do its thing. But now, after laboring for so long and knowing I had to relent to the unthinkable, I wonder if those experiences will tarnish my “2nd chance” provided I get one. One thing I know for sure is that birth is a powerful thing. The experience itself is far more powerful and lasting than I ever realized. I hope that every woman gets the birth she wants. But I also know that isn’t realistic. In that case, I hope women who feel slighted would find hope and comfort in the fact that they are not alone. Their choices matter. Their voices are heard and they are not to blame. Sometimes we get the crap hand. But in the end our babies are beautiful. That was very interesting. Thanks for sharing! I have a linky party going on where you can enter a post about anything you want to share with others. I would love it if you entered this one! much love to you, andrea in all of this. it's big stuff and i am so glad that you are willing to talk about it. if you want to talk VBAC in the triangle area, i am here for ya. be in touch. found your blog through SITS, and saw this post…I could totally relate. While I had both my babies through C-Section, and I wouldn't change a thing…I can't help to wonder "what if?"